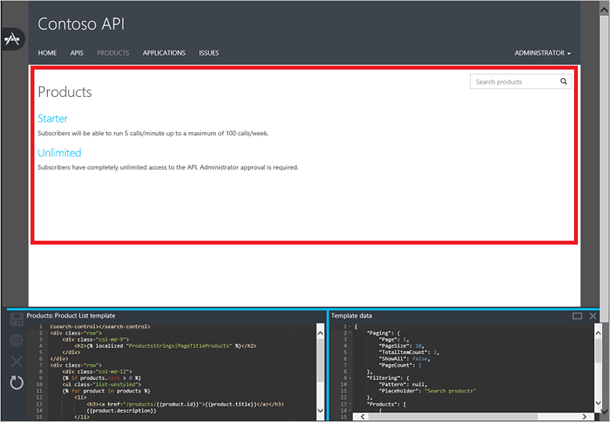 Azure API Management provides several customization features that you can use to customize the look and feel of your developer portal, and now provides a way to customize the content of the developer portal pages themselves. By using a provided set of templates, localized string resources, icons, page controls, and DotLiquid syntax, you have great flexibility to configure the content of the pages as you see fit. API Management provides a comprehensive set of templates covering the various pages in the developer portal. Clicking a template takes you to the developer portal page that is customizable by that template. In this example the Product list template is displayed. The Product list template controls the area of the screen indicated by the red rectangle. The editor for each developer portal template has two sections displayed at the bottom of the page. The left-hand side displays the editing pane for the template, and the right-hand side displays the data model for the template. The template editing pane contains the markup that controls the appearance and behavior of the corresponding page in the developer portal. By editing this markup, you can make any desired changes to the content of the page. The Template data pane provides a guide to the data model for the entities that are available for use in a particular template. It provides this guide by displaying the live data that are currently displayed in the developer portal. You can expand the template panes by clicking the rectangle in the upper-right corner of the Template data pane. Any changes you make are previewed immediately in the browser so you can review them, but are not visible to your developers until you save and publish the template. To get started working with developer portal templates, see How to customize the Azure API Management developer portal using templates. To see a video of adding a discussion board and ratings to the API and operation pages of the developer portal, see Adding developer portal functionality using templates.